St. Cuthbert’s Church, Church Bank, Benfieldside. On wall opposite the south door. Unveiled 15th January 1921 by Maj.Gen. Sir Percy Wilkinson, K.C.M.G., dedicated by Dr. Hensley Henson, Bishop of Durham. Plaque of white marble 3 feet 10 inches high x 2 feet 8 inches wide with shallow domed top set into a black marble rectangular frame 6 inches wider all round. The dedication is at the top, the quotation at the bottom. Lettering is in gilded Roman capitals for the names and Gothic script for the dedication and quotation. Marble on black marble pattress. Greater love hath no man than this, that a man / lay down his life for his friends. Messrs. W. Ayton & Sons, Blackhill. Illustrated Chronicle 17/01/1921 reports unveiling. Northern Echo 17/01/1921 reports unveiling. Consett Guardian 21/01/1921 reports unveiling. Consett and Stanley Chronicle 21/01/1921 reports unveiling. Stanley News 20/01/1921 reports unveiling. 1. Alan and Dorothy Hall in memory of Tom Hall 14/06/1917. lay down his life for his friends. 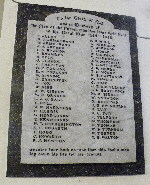 The names of those who served from Shotley Bridge are listed as follows.